Dental assistants wear many hats. Their tasks vary from cleanings to office work and cover a wide variety of skills. Dental assistants keep the office running as they participate in so much of the patient care process. As a dental assistant, you’ll learn a myriad of skills that will help you succeed in the workplace and in your personal life. When patients come into the office, dental assistants greet them and show them to their room. Assistants will help them into the dental chair and make sure that they are comfortable. They may also take their information up front before taking them back, depending on the dental office. The equipment used in the dental office is used by both the dentist and the assistants. But the assistant will sterilize and prepare the needed equipment. One of the first things done when patients come into the office—x-rays. Assistants take patients x-rays and process them to help determine what (if any) dental work needs to be done. When there are procedures that need to be done, such as cavity fillings, crowns, etc., assistants are there to assist the dentist in any way needed. These duties will vary based on the office you work in, but generally speaking dental assistants will have a good knowledge of procedures as they participate in many of them. Dental assistants may also have the duty of keeping and organizing dental records. The information obtained during a dental examination is recorded and stored by the dental assistant. Cleanings are very important and often the reason people come to the dentist. Dental assistants will provide cleaning that includes tooth scaling, polishing, and often fluoride treatment. There are various reasons to take impressions—mouth guards, whitening trays, retainers, crowns, bridges, veneers, dentures, and so on. A dental impression is an imprint of the teeth, it generally only takes a few minutes. 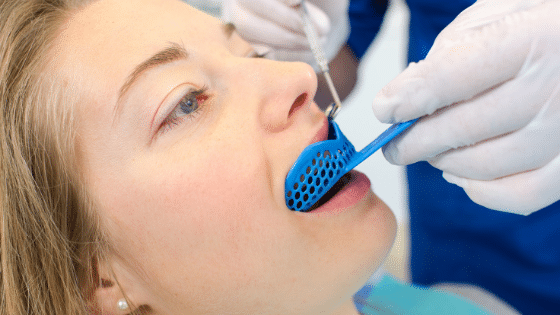 The process may vary based on your office, but generally, you’ll use trays filled with a special impression material to get a mold of the teeth. Some dental assistants may perform some office managerial tasks, such as scheduling appointments. You may schedule the follow-up appointment after a semi-annual cleaning. After scheduling an appointment, a dental assistant may also process billing and payment. Again, this will depend on the office you work in, but you may have some office tasks that require basic computer know how. Dental assistants will usually educate patients on proper oral hygiene. As a dental professional, you may see where the patient is lacking in their oral care. Even if you don’t see any particularly weak stops, educating patients on the importance of oral hygiene is vital. You may teach them about proper flossing technique, to the importance of using fluoride.